THIS AGREEMENT (“Agreement”) is entered into and effective upon purchase of the Job Offer Academy (“Effective Date”), between Ashley International, Inc. (“Ashley International), a California corporation, and you, an individual (“Participant” or “You”). Ashley International’s Job Offer Academy private Facebook page is a place for members to share ideas. There is no guarantee that your resume, questions, or comments will be reviewed. Notwithstanding anything to the contrary contained herein, Ashley International does not guarantee that any or all of your questions or any or all of the questions raised by other members will be answered by Ashley International in a timely manner, or at all. Your right to participate in Ashley International’s private Facebook group is strictly subject to, and contingent upon, you adhering to any and all rules established by Ashley International and/or Facebook related to participating in Ashley International’s private Facebook page. Without limiting the generality of the foregoing, you may not promote you, any business, any services, or any products on the Ashley International private Facebook page. Ashley International reserves the right terminate your access to and/or delete comments on the Ashley International private Facebook page in the event you make offensive, derogatory, harassing, or demeaning comments, or post comments that are outside the subject matter (ie. career related). Participant understands and agrees that this Program is for educational and quality of life enhancing purposes centered in philosophies of integrity and truth and based upon professional training, and business and personal experience. Price. The purchase price for the Program is $197 paid in full in advance. A rejected payment may cause immediate suspension or termination of services, at Ashley International’s option. Refunds. If after seven (7) days, you are not satisfied with the quality of this program, please contact Ashley International’s team letting them know at support@ashleyinternational.com and turn in your completed homework (per the homework checklist below and in the membership area), and a full refund will be issued. Upon such termination you will immediately lose your log-in access to the Job Offer Academy and will be terminated as a client. After seven (7) days from the date of purchase of the Program, your right to a refund will expire and terminate. 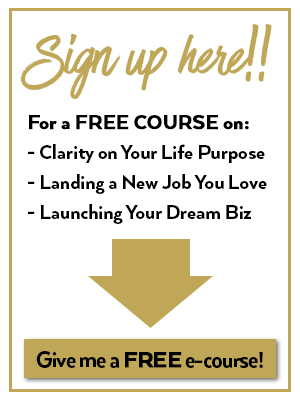 Free Jumpstart Course. The Job Offer Academy free course, or any free courses offered by Ashley International, are at our sole discretion, and can be revoked at any given time. Do the LinkedIn Clarity Exercise. Commit to two job functions for your hunt. Make a list of 75 companies you’re interested in. Identify your beliefs on the list. Identify your top five core values. Write a one-page vision of your ideal career. What four words would you family use to describe you? What are your top three gifts, passions and core values? Watch my TEDx Talk, and answer the three questions. Write out your story, cuff, skill and goal for a completed elevator pitch. Re-write your resume with all suggestions from module 3 included. Find your two key points of contact in each company (the company’s HR professional and your potential boss). If you can’t find HR, make sure to at least find your Potential Boss. After finding the two relevant points of contact, find the email of every person in every company. 80% are searchable. Write a cold email to all of the contacts on your company list (75 companies). No Guarantee of Results. Ashley International cannot and does not guarantee results. You understand and agree that you are fully responsible for obtaining your desired results from the Program. In the event Participant participates in live sessions (voice, skype or otherwise) with Ashley International and/or Ashley International’s private Facebook group, with or without other participants, Ashley International and Participant will communicate with each other in an open, supportive, and constructive manner at all times. Participant will be fully present, ready, willing and able to fully participate in the live sessions, without distractions. You are fully responsible for decisions made and/or actions taken or not taken as a result of your live sessions with Ashley International and/or your participation in the Program. Coaching and Not Therapy. Coaching is not therapy. It is not psychotherapy, psychoanalysis, mental health care or substance abuse treatment. Therapy addresses past events and how these events may be affecting you in the present. Coaching addresses the present and future and recommends certain actions to reach your stated goals in your business or personal life. These recommendations are based upon the coach’s knowledge, experience, and expertise. ANY AND ALL SERVICES, PRODUCTS, INFORMATION, AND CONTENT PROVIDED TO YOU BY ASHLEY INTERNATIONAL INCLUDING, WITHOUT LIMITATION, THE JOB OFFER ACADEMY ARE NOT THERAPY. THE SERVICES, PRODUCTS, INFORMATION, AND CONTENT PROVIDED BY ASHLEY INTERNATIONAL THIS PROGRAM OR ANY OTHER PROGRAM OR OTHERWISE ARE NOT AN ALTERNATIVE TO, OR SUBSTITUTE FOR, THE MENTAL HEALTH SERVICES OF A LICENSED THERAPIST. WE URGE YOU TO CONSULT A LICENSED THERAPIST FOR THE DIAGNOSIS AND TREATMENT OF MENTAL HEALTH ISSUES. NOTWITHSTANDING ANYTHING TO THE CONTRARY CONTAINED HEREIN, IN THE EVENT ASHLEY INTERNATIONAL BELIEVES YOU ARE MAY HARM YOURSELF OR OTHERS, OR ASHLEY INTERNATIONAL BECOMES AWARE OF CHILD AND/OR ELDER ABUSE OR NEGLECT, ASHLEY INTERNATIONAL MAY TAKE ANY AND ALL ACTIONS ASHLEY INTERNATIONAL DEEMS NECESSARY OR APPROPRIATE UNDER THE CIRCUMSTANCES INCLUDING, WITHOUT LIMITATION, CONTACTING POLICE AUTHORITIES OR FAMILY MEMBERS, AND ASHLEY INTERNATIONAL WILL NOT BE LIABLIE TO PARTICIPANT OR ANY THIRD PARTIES FOR TAKING SUCH ACTION TO PROTECT PARTICIPANT OR OTHERS. NOTWITHSTANDING THE FOREGOING, ASHLEY INTERNATIONAL HAS NO DUTY TO PARTICIPANT OR ANY THIRD PARTIES AND WILL NOT BE LIABLIE TO PARTICIPANT OR ANY THIRD PARTIES FOR ASHLEY INTERNATIONAL’S FAILURE TO TAKE ANY SUCH ACTION TO PROTECT PARTICIPANT OR THIRD PARTIES. Assignability and Third Party Beneficiaries. Participant may assign this Agreement and/or any rights, obligations, and/or claims under this Agreement with the prior written consent of Ashley International in each instance, and any attempted assignment without such consent is null and void. Ashley International may assign this Agreement without limitation. This Agreement will be binding upon and shall inure to the benefit of the respective trustees, legatees, devisees, heirs, executors, administrators, assigns and successors in interest of the parties. Please acknowledge your approval by checking the box on the Job Offer Academy Order form, where indicated.